Bejac is proud to offer quality rental equipment at competitive rates. 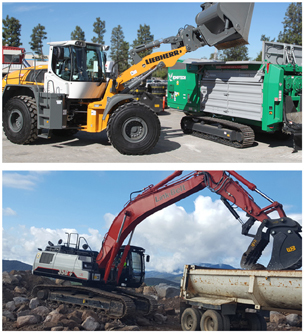 We have machines available for rent to expand your fleet quickly, when you need additional equipment for an unusual job, or have a sudden increase in work. At Bejac, we can help you match your tasks to the machines that will accomplish them most efficiently. All of our equipment is routinely inspected, and maintenance is performed at intervals specified by the manufacturer to avoid unexpected downtime. Rental rates are based on an 8 hour day, 40 hour week and 160 hours/4 week month. Acceptable insurance must be on file at the time of rental. Premium rates or additional charges may be required if rental equipment wear-rates are excessive due to machine applications and/or jobsite materials. Rental rates are F.O.B. designated Bejac facility. Possession of rented equipment is granted to the rentee prior to its leaving renter's premises, regardless of the method of delivery. All rates quoted subject to respective area's sales tax. Environmental fee applies to all rentals. Customer must furnish qualified operator and use equipment within its rated capacity. Customer ensures that normal daily maintenance is performed, such as fuel, grease, oil level checks, tire pressure, etc. Customer will be liable for any maintenance or repairs required beyond normal wear and tear, and for any tire damage. Machine to be returned reasonably clean. See the front and back of rental contract for complete terms and conditions. Prices subject to change without notice.